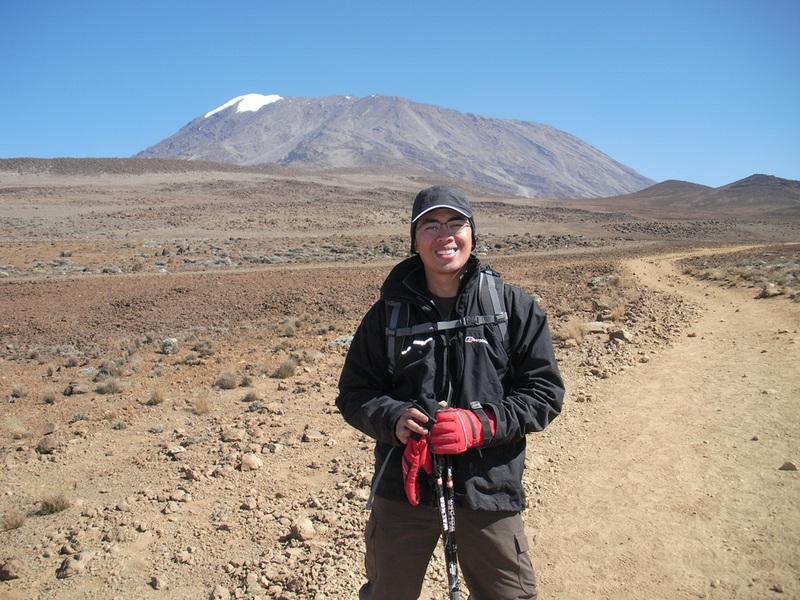 I was in Tanzania from 1st July to 10th July 2011 to climb Mount Kilimanjaro and to experience the Safari. Below is a detailed account of my trip. Note: click on images to enlarge and click on links for further info. Earlier in our discussion, we were considering Marangu (a route with huts, no camping required) and Machame (a very famous route that offers excellent scenery). 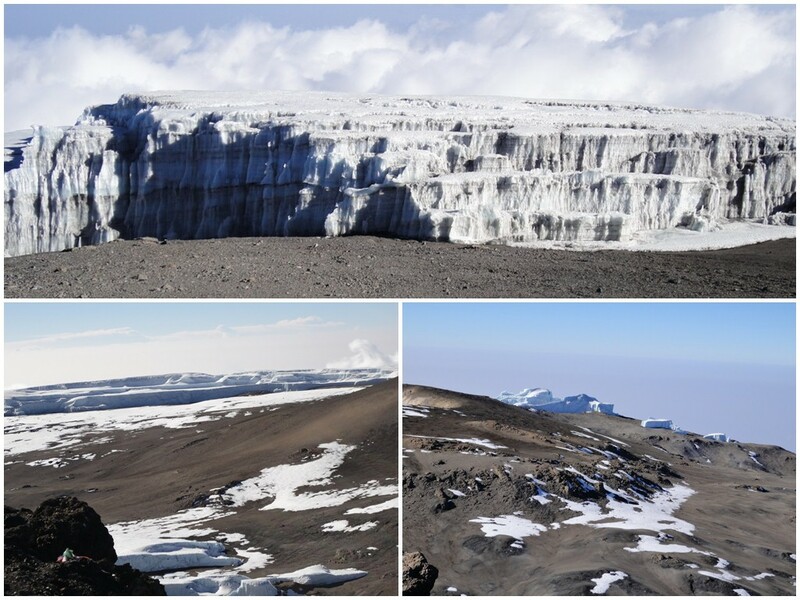 However, given that we wanted a route that offers the best acclimatisation and the best summit rates, the mountain operator suggested their own version of Rongai, dubbed “TK Rongai”. TK, which stands for Team Kilimanjaro, has developed their own version of Rongai which is by far one of the most unique on the market due to its excellent acclamatisation and high success rate. This is a full camping route that starts at the north of the mountain (in red in the map above) and ends at the south-east of the mountain (down the Marangu route, marked in light green in the map), hence you get to see both sides of the mountain. 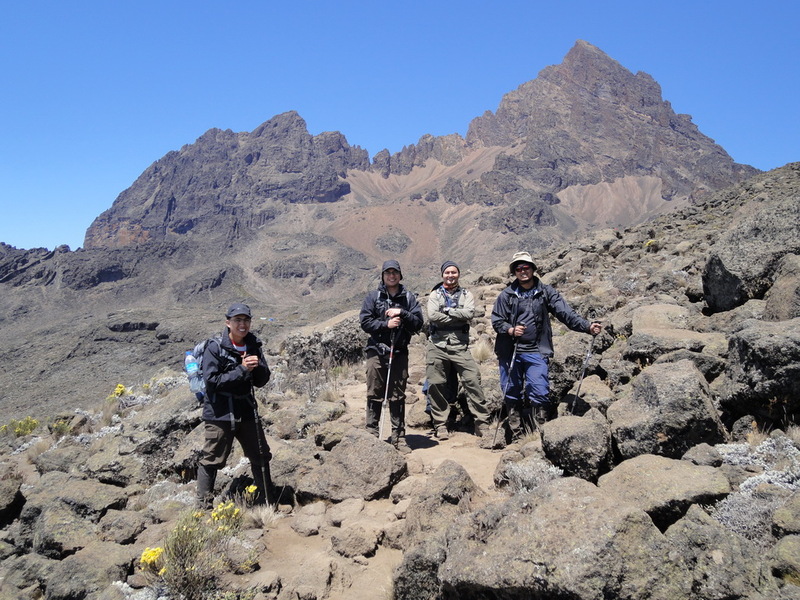 Our decision to go with Team Kilimanjaro and to choose their specially tailored TK Rongai route was the best decision we made that guaranteed us a trouble-free trip and first class service by TK’s team members. The flight from Kuala Lumpur to Dar Es Salaam was on Qatar Airways. The flight cost was RM4,333 (US$1,443). 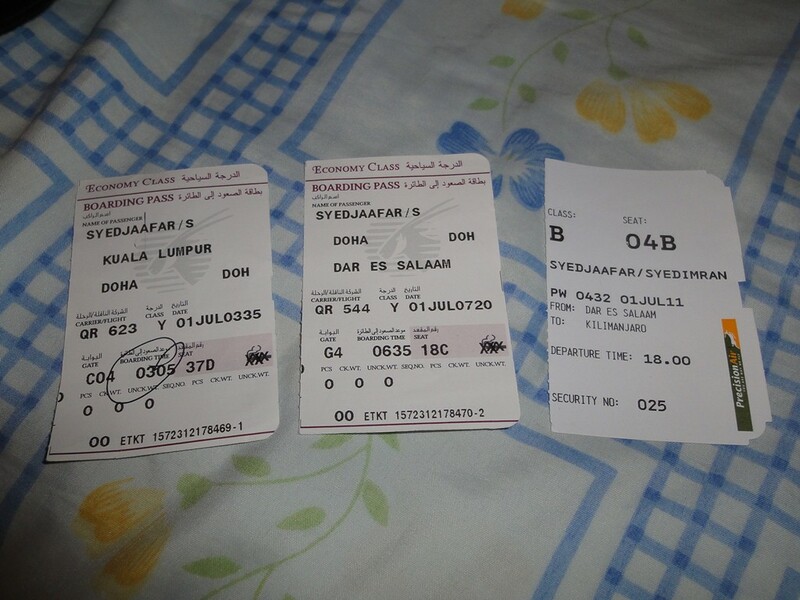 I bought this ticket directly from Qatar Airways’ website. 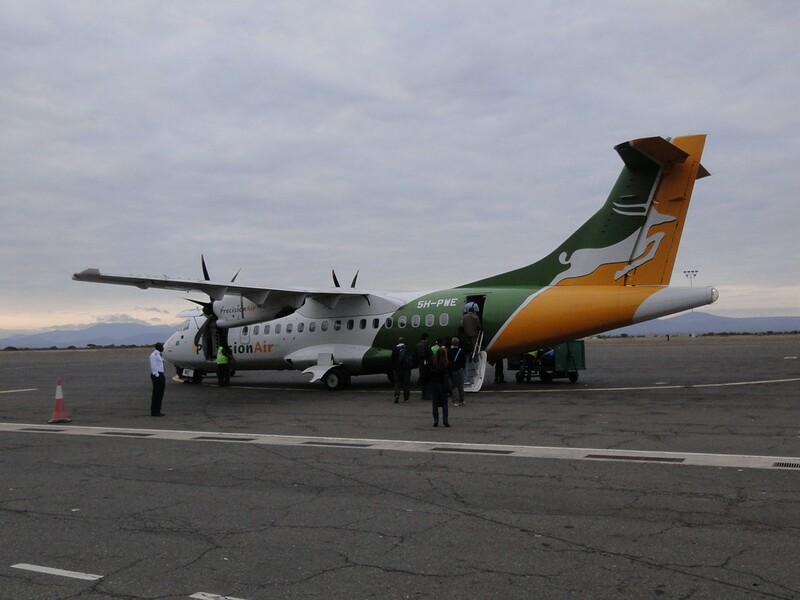 The flight from Dar Es Salaam to Kilimanjaro was on Precision Air, a local airline. The flight cost was RM1,008 (US$336). I bought this ticket from Vayama.com. For Malaysian travelers, we do not need to obtain Visa into Tanzania. The immigration officer will greet you with a friendly “karibu” at the airport. Most non-African nationalities are requested to obtain visa on arrival. Upon arrival in Kilimanjaro airport, TK picked us up and transferred us to Arusha, where we would be spending 2 nights before the climb. The journey from Kilimanjaro airport to Arusha took around 45 mins. Yup, as you can see, it was quite like a small platoon moving up the mountain. Initially the plan was for us to head to Marangu Gate (Kilimanjaro National park’s main gate) for registration, and from there we’ll head to Rongai Gate. The journey from Arusha to Marangu was scheduled to be around 1 hour 30 mins, and from there to Rongai Gate should take an additional 3 hours. On the way, Sifuel sent somebody from the office in Arusha to register for us, that way we saved 1 hour of traveling time. We went straight to Rongai Gate. At the Rongai Gate, the guides then started to assign all porters with their share of luggage and items to be carried. All items were weighted to ensure equal distribution. 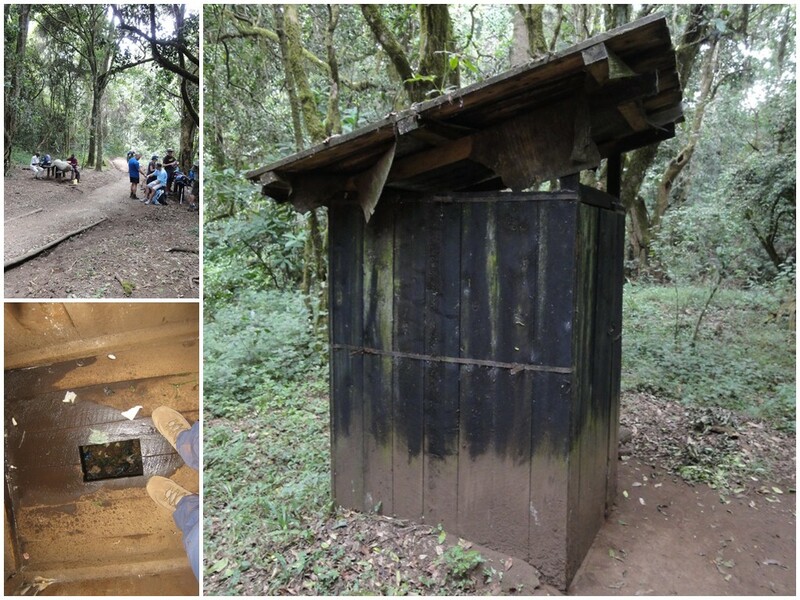 We had lunch at a hut at Rongai Gate, and around 2PM, we started our hike. Rongai gate was at 1997m AMSL. The plan today is that we’ll be hiking from Rongai Gate to Simba Camp (2635m AMSL). 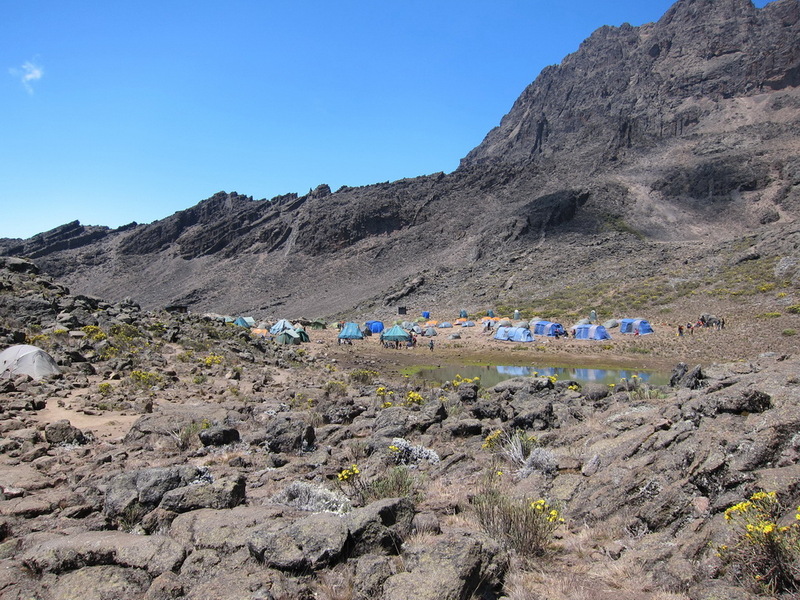 Based on many reviews, the first day of the Rongai route was supposedly the “ugliest” in Kilimanjaro. The slopes upwards passed through pine plantations followed by fields of potato, maize and a number of wooden shacks by the local Chagga tribe. To be honest I wasn’t that concerned nor disturbed with this. The various plantations looked completely fine to me. I enjoyed the various scenery throughout the trip. We reached Simba Camp (2635m AMSL) around 5PM. The weather was chilly and there were a number of camps nearby. I inspected the tents they gave us and I was really impressed. The mess tent (blue colour) was huge, and our personal tents (green colour, twin sharing) was of high quality. 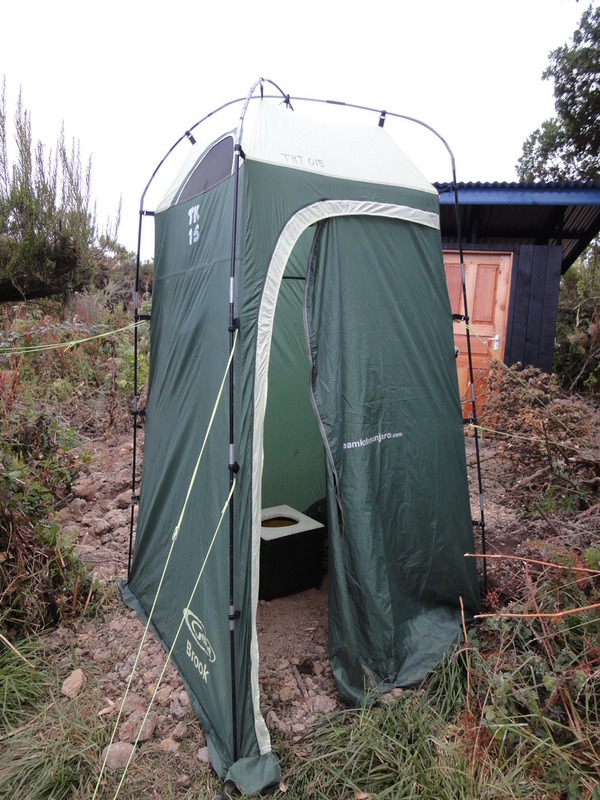 I was also relieved to see that our “personal toilet” looks very pleasant and easy to use (it was way better than the notorious Kilimanjaro public toilet provided at the campsite). 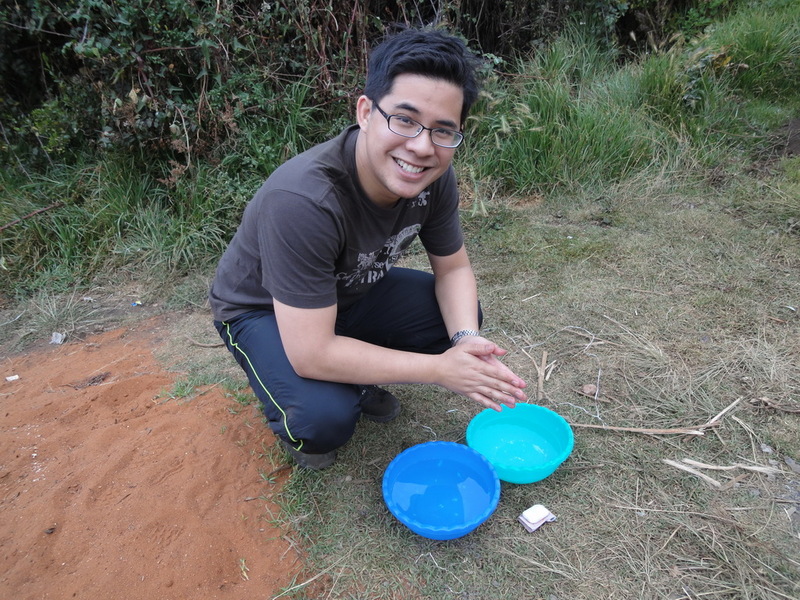 Nickson and Mark provided us our personal wash basins to wash ourselves. Later we discovered these wash basins would be given to us every morning and every evening. After washing up, we went into the mess tent for tea time. We were shocked to see the well organised eating table and the popcorn served. Throughout our 7 day trip, popcorn is served for teatime along with hot coffee or tea. After we were done with teatime, we relaxed a bit in our tent and explored the campsite. Dinner was served at 7PM. Again we were surprised with the high quality food. We were served potatoes and beef stew. It was during dinner that Nickson introduced himself formally as our waiter. He said we could talk to him about anything, from the mountain, to culture, to even Tanzanian politics. Over the next few days, me and Nickson talked about all sorts of topics. He was a great companion over those freezing nights. Discussing on various issues really takes your mind off the fatigue and the difficulty that lies ahead. Later when the sun set, the weather got colder. We realized that it’s only at 2635m and the evening temperature was around 12 to 15 degrees. Little did we know, over the following next few days, the evening temperature at our camps would reach sub-zero. Throughout this trip, we were prepared to face mountain sickness (read about Acute Mountain Sickness (AMS) here), but we were definitely not prepared for the cold. We woke up early around 6AM. Nickson and Mark brought coffee and tea to our tents. After our wake-up drink, around 15 mins later, they brought our washing basins. 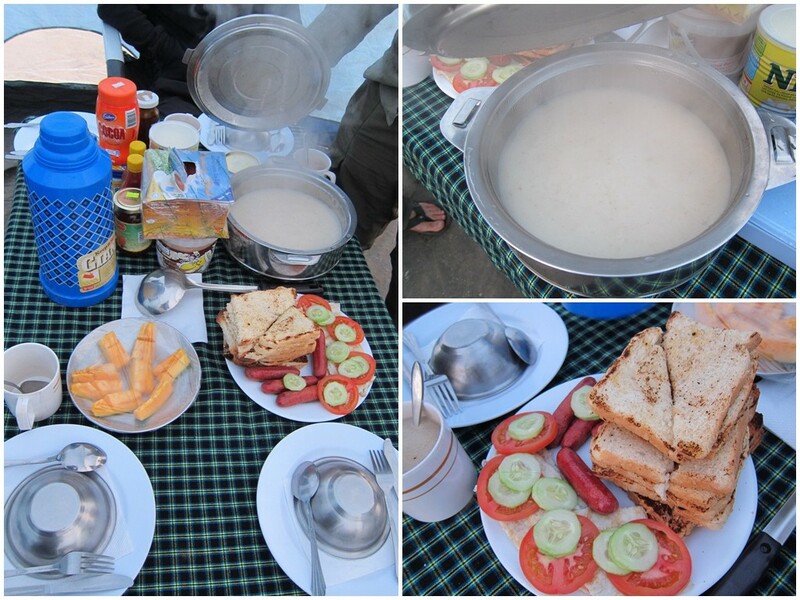 After we washed ourselves in the freezing cold, breakfast was served at the mess tent at 6:30AM. We were shocked to be served toast and sausages, along with porridge! This is even better than what we get back at home! After breakfast, we quickly packed up and by 7:30AM we left Simba Camp. 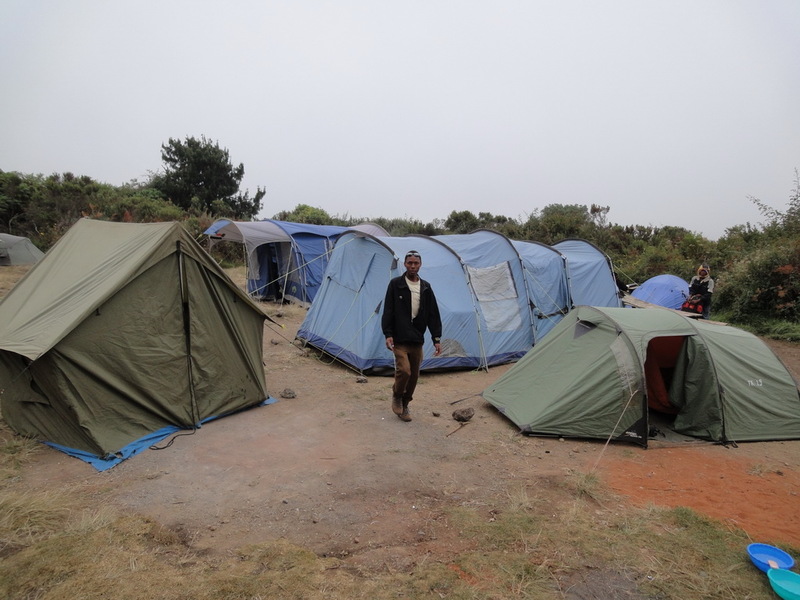 Simba Camp, at 2635m AMSL, was at the same level with the clouds. After 1 hour of trekking upwards, we could see the clouldline beneath us. The view was breathtaking. We trekked for about 5 hours and had lunch at Second Cave (3487m). There were 2 sections to the Second Cave site. A section was reserved for folks that will be camping and staying the night there, and the other section was for teams that planned to stay there for lunch. We had our lunch just outside of cave. Again, we were shocked with the high quality food that was served. 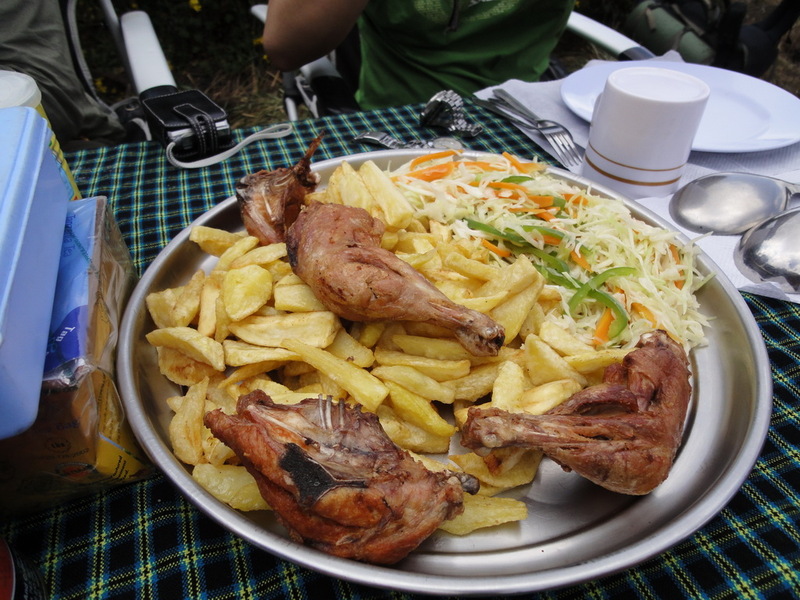 Today we were served our favourite “kuku na chipsi” (Swahili for Chicken and Chips). It’s a popular dish throughout Tanzania. There’s a thing about how they fry their chicken that makes it so tasty. After lunch, we had our usual tea and coffee, and continued the journey to Kikelelwa Camp (3675m). The trek after lunch wasn’t as steep as in the morning. It took us an additional 4 hours from lunch to reach the camp. The view of Kikelelwa was stunning. We had our usual teatime (popcorn), and for dinner we were served hot steamy rice and beef stew. Nothing beats hot rice in the cold weather. The temperature was much colder compared to Simba Camp and we were literally freezing. It was difficult to sleep in such low temperatures. Good thing TK gave us high quality sleeping bags. By the second night (at Kikelelwa), I have figured out how to properly use the sleeping bag. Once you’re tucked in and it’s all zipped up properly, it can be quite warm. After yesterdays long and exhausting trek, today’s trek was relatively shorter, but just as streneous. This is because we’re going higher up in the mountain and our body needs time to acclamatize to higher altitude. 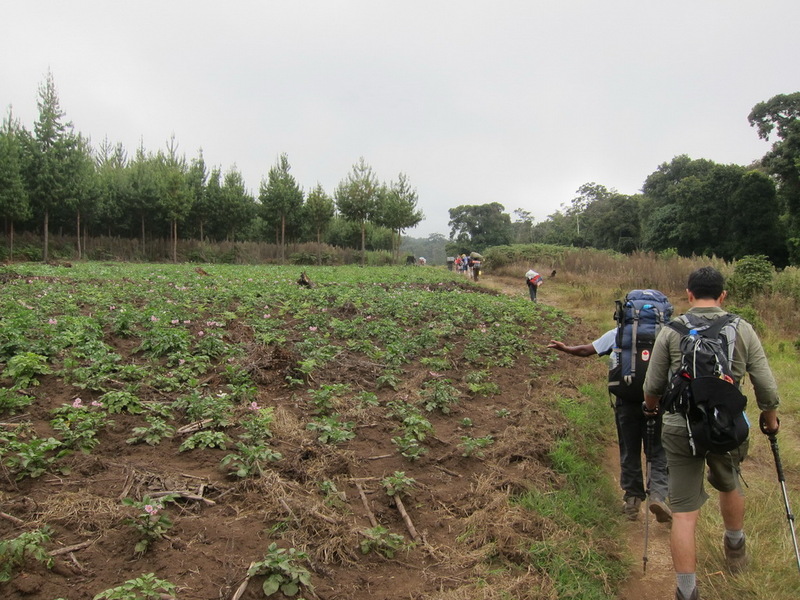 As we were trekking to Mawenzi, we can see that we were leaving Kilimanjaro on our far right. This is all part of the plan as the Rongai Route is meant to help you acclimatize. 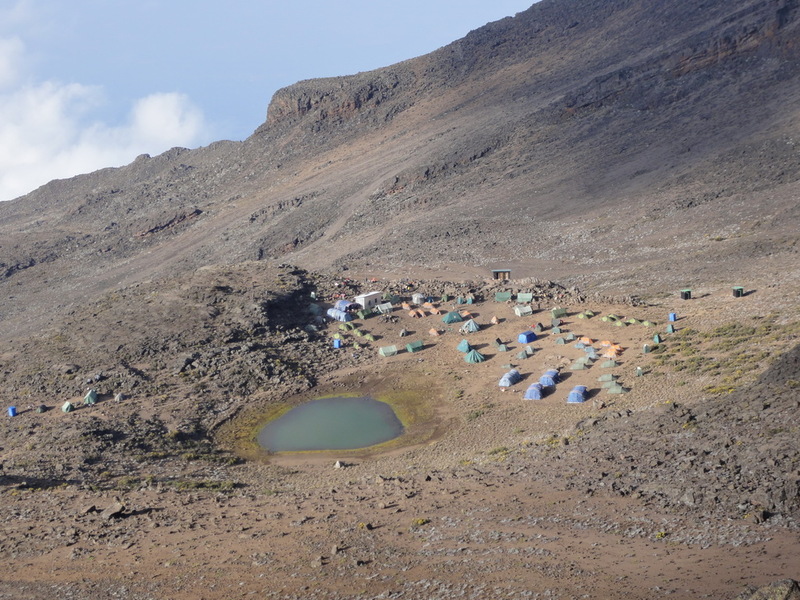 The route to Mawenzi is part of the acclimatization process. 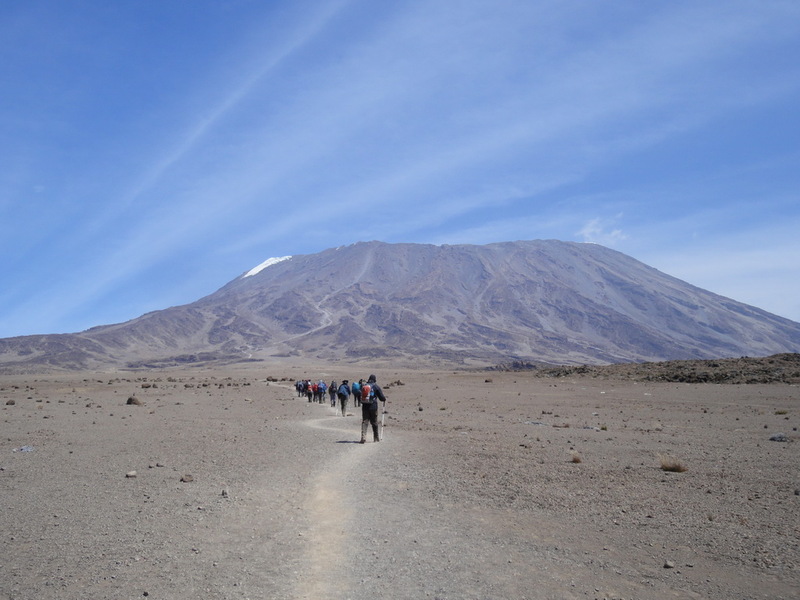 Later when we arrived at Mawenzi we went for an acclimatization walk up to 4500m. 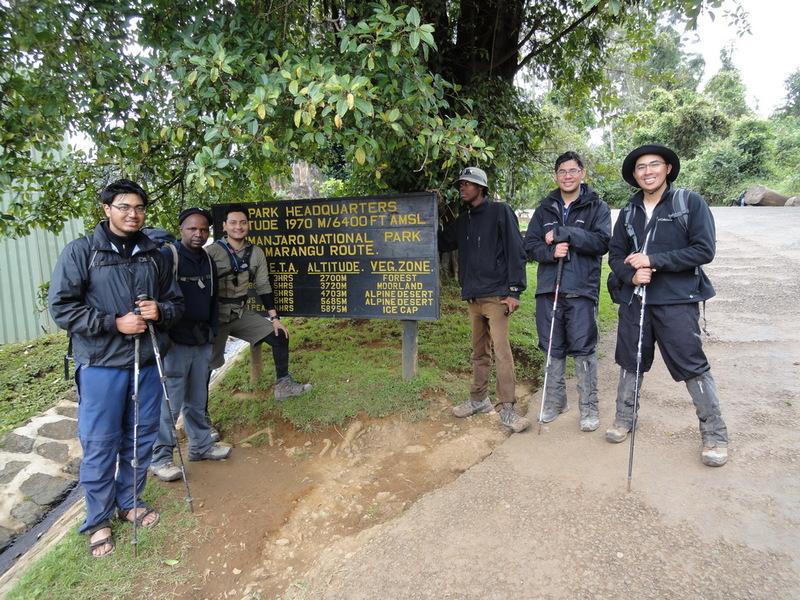 Along the way, we took a photo at 4100m AMSL, the point where we exceeded Mount Kinabalu (4095m). From then onwards it was a different game altogether as our bodies have never reached these altitudes. 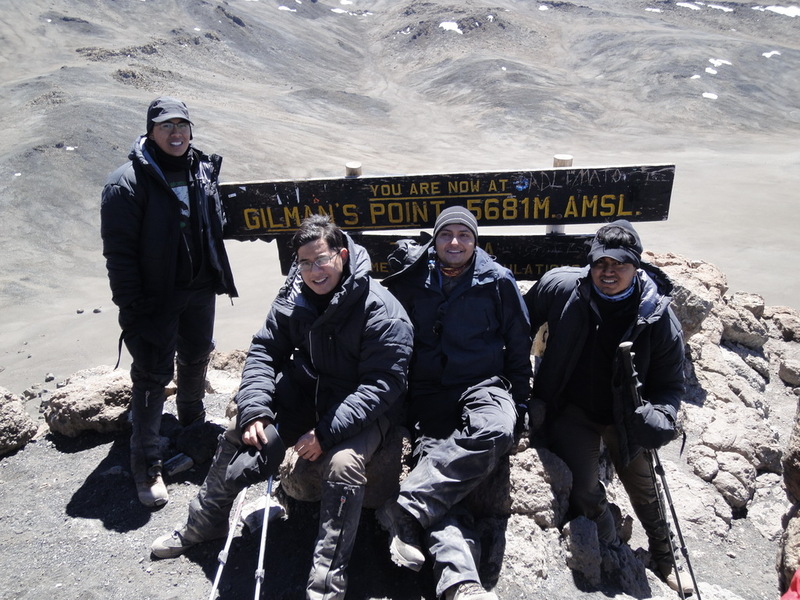 All team members (except for Farooq) experienced various mountain sickness symptoms such as headache, loss of appetite, nausea and difficulty in breathing. Mawenzi Camp was something that look right out from Lord of the Rings. It was situated at the foot of Mawenzi Peak, with a small lake with an underground stream. There was a bit of mobile phone reception at Mawenzi and I quickly tweeted a photo. 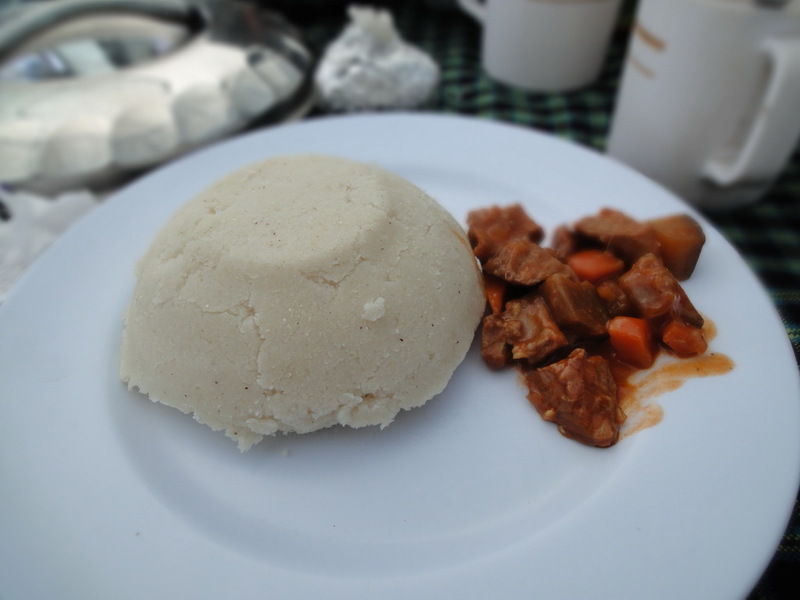 Today’s lunch was the famous East African dish Ugali. 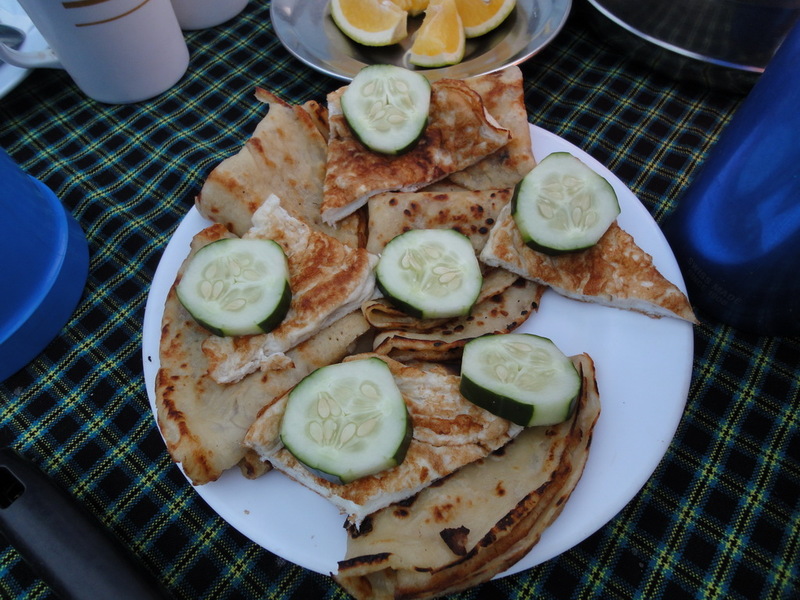 It is made from maize flour (cornmeal), cooked with water to a porridge- or dough-like consistency. We had that with our usual beef stew. However, despite being hungry, we didn’t have the appetite to eat. 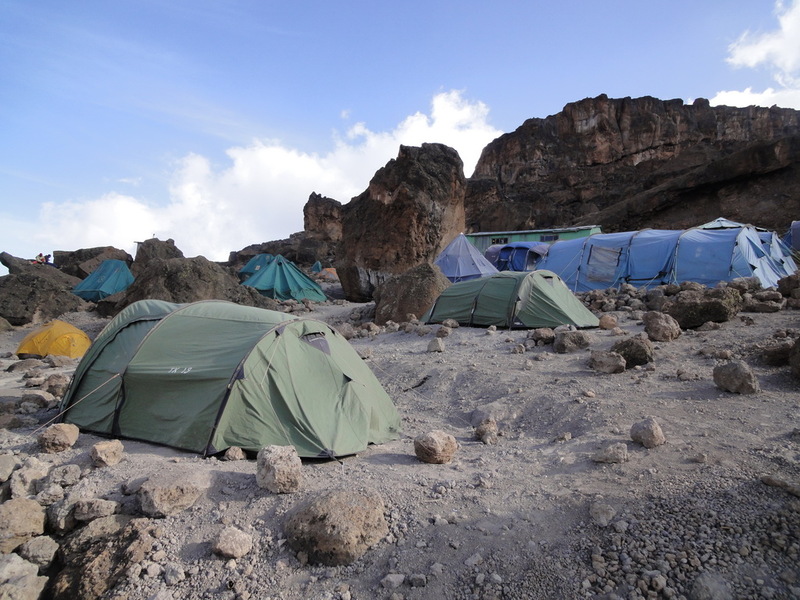 After eating half of the ugali, we went back to our tents for a short rest. This is part of the affects of being in high altitude, it lowers your appetite to eat. 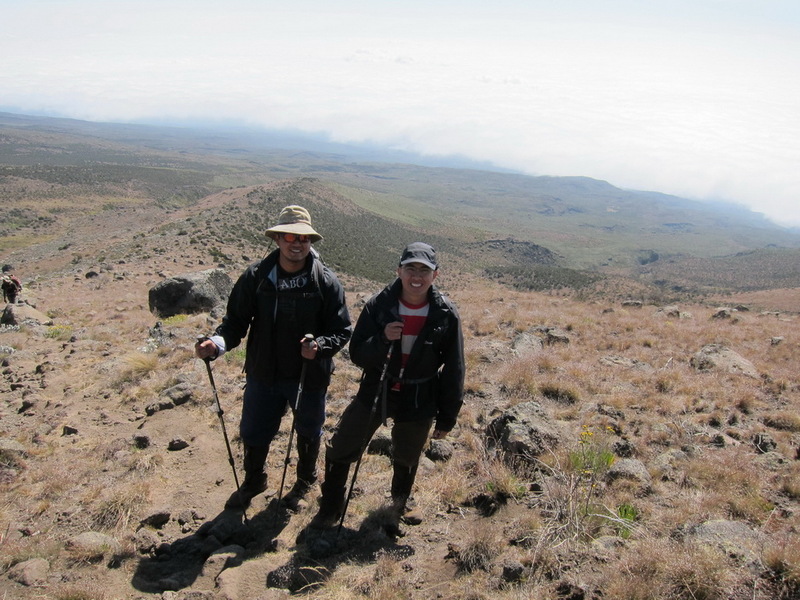 Around 4:00PM, Tom and Max took us for an acclimatization walk up to 4500m on Mawenzi. This is one of the features that I like with the TK Rongai route. 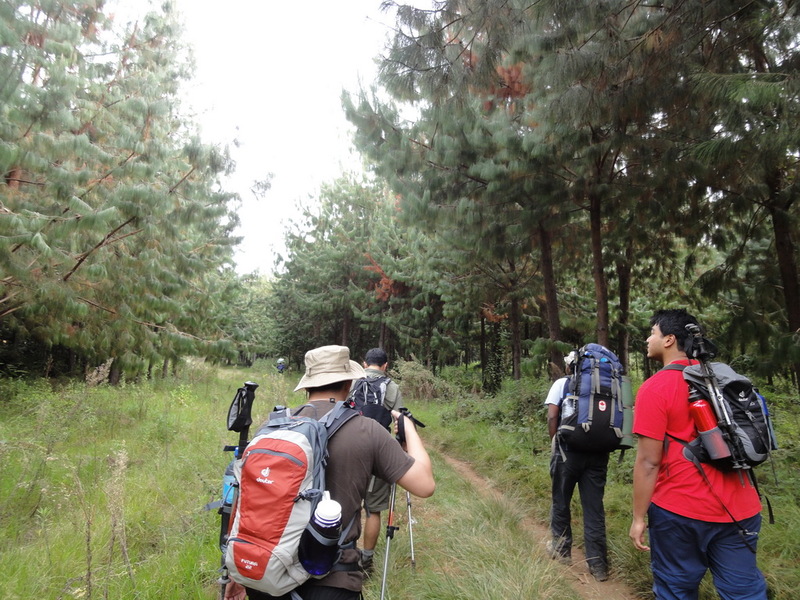 It gives you ample opportunity to acclimatize as the trek is planned on the “climb high, sleep low” methodology. The hike up the hill beside Mawenzi took us around 1 hour 30 mins. We had a good view of Mawenzi at the top of the rocky hill. At the top, we stayed there around 15-20 mins to give our bodies a feel of the altitude at 4500m. After dinner, our guides asked if we needed Diamox and me, Aiman and Fazril took 125mg each. That’s half a pill of the standard dosage (the standard pill is 250mg). That night we slept around 9:30PM. The surroundings were much more colder than Kikelelwa. You see, it’s not a pleasant experience to leave your comfortable sleeping bag around 2AM to use the toilet. It’s extremely cold (around 2-5 degrees). After day 2, we realized the big difference sunlight made despite the freezing winds. We made it a habit to wait until the sun is fully out around 6AM – 6:15AM before going out of our tents. That morning we had our usual breakfast. It was freezing in the morning, but once the sun was out, it became quite bearable. 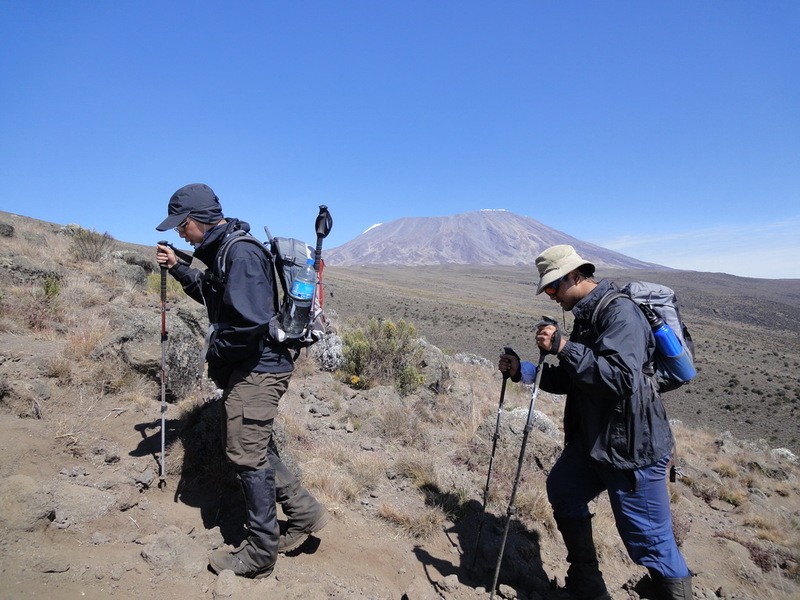 We crossed the small hill that we went for acclimatization yesterday, and from then onwards it was a flat plane with a steady inclination towards Kilimanjaro. Later I was told the flat plane was called The Saddle. We could see Kibo Hut from far. School Hut was not visible as it’s covered by a ridge. Trekking at 4300m to 4700m isn’t easy. The thin air resulted in us getting tired faster. Towards the end of the route, there was some rocky area that despite the guide saying “School Hut is just 30 mins away”, we still couldn’t see it. We reached School Hut (4717m) around 4:00PM. We were dead tired and went straight for lunch. Initially there was supposed to be an acclimatization walk after lunch, but looking at how exhausted we were, the guides decided to cancel it. Tonight is our summit attempt. Sifuel told us that he believes it’s best that we attempt a “day summit”, rather than a “night summit”. 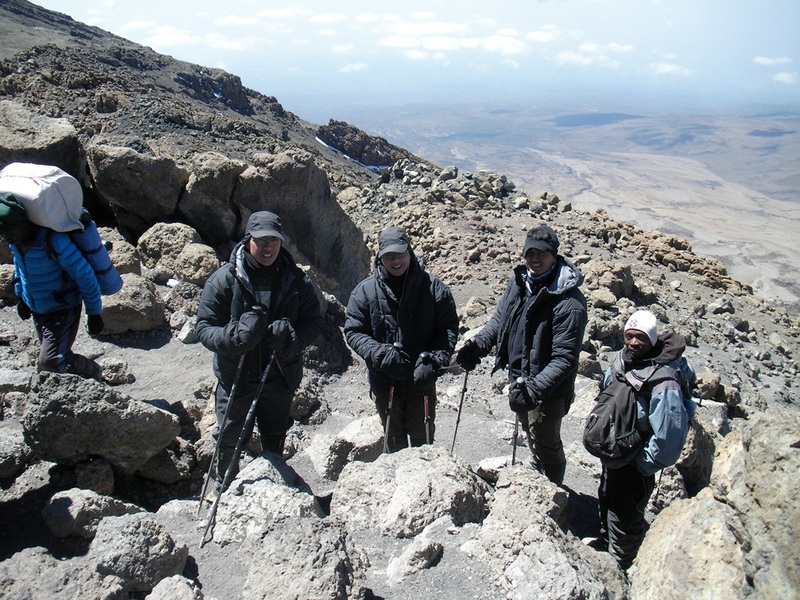 A “night summit” attempt would start at midnight, and you are expected to reach Uhuru Peak around sunrise. A “night summit” starts around 4AM, and you are expected to reach Uhuru around 6 hours later, around 10AM. We unanimously agreed that we were not keen on seeing the sunrise as the we needed the sun to be out for our hike. We had an early dinner, around 6:30PM. During dinner, Sifuel briefed us on our summit attempt. He said that we will have 2 summit attempts. One tonight, and another tomorrow, just in case if everything goes bad. He told us to wear 4 layers for our top, 4 layers for our bottom and 3 layers of socks. We woke up around 2AM. After having breakfast and a last minute briefing, we started our ascent at 3:50AM. Most of us didn’t wear 4 layers of pants. I had my Millet Thermal pants layer as my first layer, and the second layer was my Columbia insulated pants, and the 3rd layer was a waterproof trackpants. Later during the summit attempt I realized there was no need for the waterproof trackpants. As for my top, I had a similar thermal body suit (only that I didnt buy the Millet one, which I regretted), the second layer is a plain long-sleeve tshirt, third layer is a fleece, and the fourth layer is my baloon-summit jacket. As for socks, I only wore 2 layers. We tracked in darkness for the first 2 hours. We were guided by our headlights, and a bit of moonlight. The guides that were assigned to me, Aiman and Fazril didn’t even use their headlights. They said they could see just fine with the minor moonlight. Amazing eyes. It was very cold, around 0-4 degrees, with the windchill factor being much colder. After trekking for nearly 2 hours, sunrise appeared and we felt slightly better. We were really exhausted by the time we got to Hans Meyer point (~5600m), and Tom (our assistant guide) even said “it’s OK even if you get to Gilman’s, it’s considered one of the peaks”. That didn’t really helped. Farooq had left us way ahead by 5:30AM. He’s a fast trekker and he is used to altitude, so he had no AMS and had the energy to push ahead. He summited within 6 hours of leaving School Hut, us (me, Fazril and Aiman) on the other hand, took 12 hours. Imagine that. Anyway, at Hans Meyer point, one of the guides pulled out 2 cans of Red Bull for us to share. I felt slightly better after that, but despite my renewed energy, I continued to trek upwards slowly and steadily. I needed a slow ascent to provide my body with enough acclimatization time to avoid AMS. Along the way, we noticed that our drinking water froze, half of the bottle was ice. Sifuel did warn us about this, and to make it still drinkable, we were advised to put the bottles in our bags upside down. That way, the top part of the bottle will freeze (just like a lake in winter, the top layer of the lake freezes, but the water below is still available), but we’ll still be able to drink the bottom part. 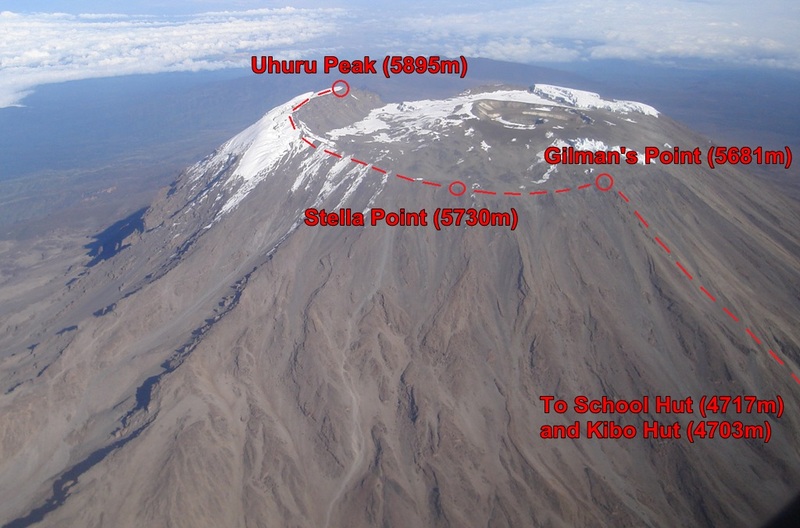 The photo above is to help readers understand the path we took from School Hut up to Gilman’s Point, and from there onwards to Stella Point and Uhuru Peak. 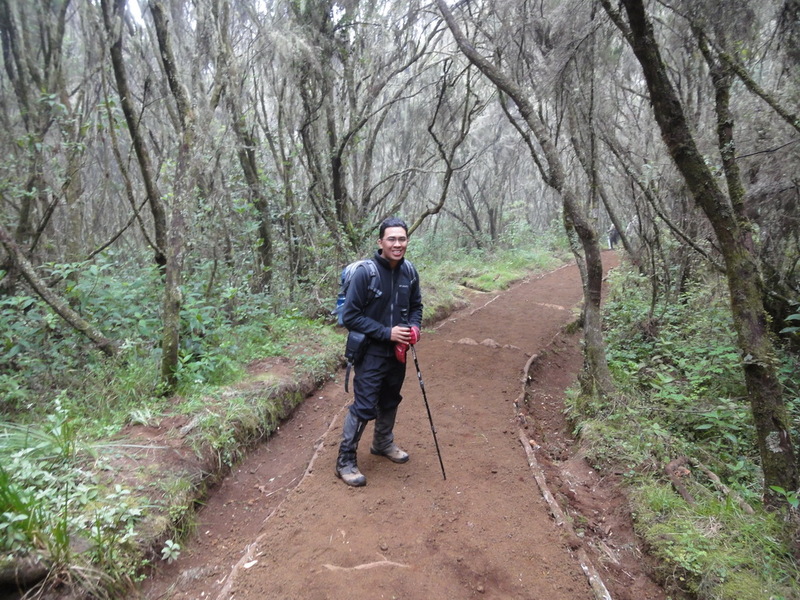 We trekked along Kilimanjaro’s rim. We reached Gilman’s Point at 1PM, nearly 9 hours after leaving School Hut. By the time we arrived at Gilman’s, Farooq was there waiting for us. He was on his way back from Uhuru Peak. At Gilman’s, one of the guides pulled out a pack of Pringles. Pringles was OK, but it wasn’t enough to provide us the energy that we needed. We have overshot the standard estimated schedule (the normal plan is that you should be back down at Kibo Hut by lunchtime), and we were really hungry. After having some other light snacks, we pushed on to Uhuru. We passed by Stella Point, and from there the guides had to push us as we were too slow. I had to trek slowly as I was out of breath if I went any faster. The same goes to Aiman and Fazril. 3 hours after our checkpoint at Gilman’s, after pushing really really hard, we reached Uhuru Peak at 4PM. That’s 12 hours after leaving School Hut, with no energy bars or proper meals. We were really exhausted, but upon seeing the Uhuru sign, we were in high spirits and extremely happy. I wouldn’t be exaggerating if I say some were almost in tears. Our struggle paid off. We were at the roof of Africa, having an unsurpassed view of our surroundings, unbeatable from anywhere on the same continent. 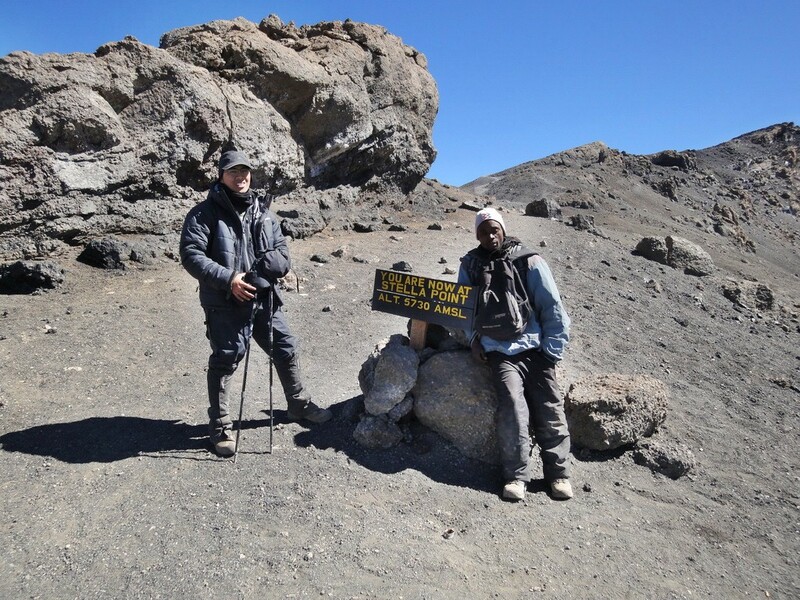 We took a number of photos and video clip at Uhuru, and around 20 mins later we were on our way down to Kibo Hut (4714m). We still had sunlight by the time we reached Gilman’s. But by the time we went below Hans Meyer point, it started to get dark. We skied down the volcanic ash after descending from Hans Meyer point, and halfway through it, it was sunset. Skiing down the volcanic ash took around 2 hours and it was quite the experience. You would think “skiing” down the volcanic ash (which is indistinguishable from small rocks) would be easy, no you’re wrong. By that time we had no energy left, we could barely walk straight, and definitely had no energy to balance ourselves properly while skiing down. Me and Fazril had to stop a few times on the volcanic ash slope to pace ourselves. 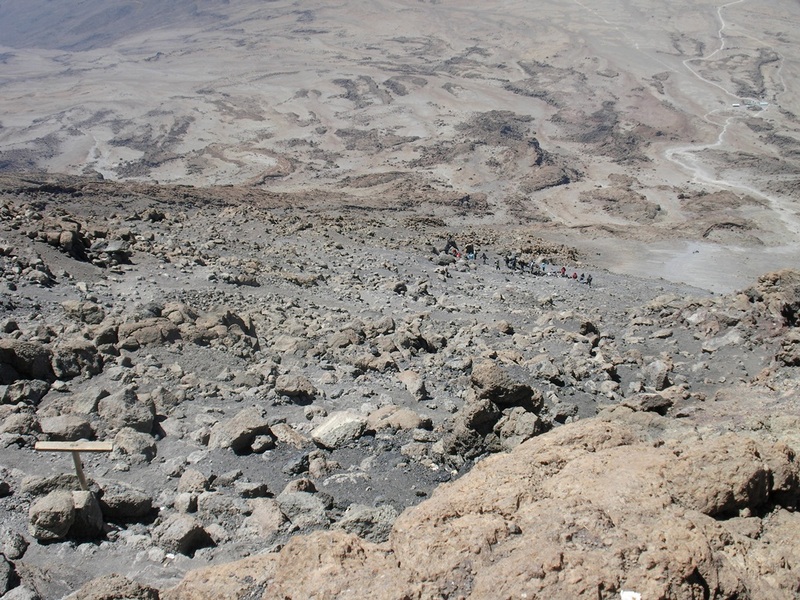 At the end of the volcanic ash, we had to trek another 30 mins before arriving at Kibo Hut. 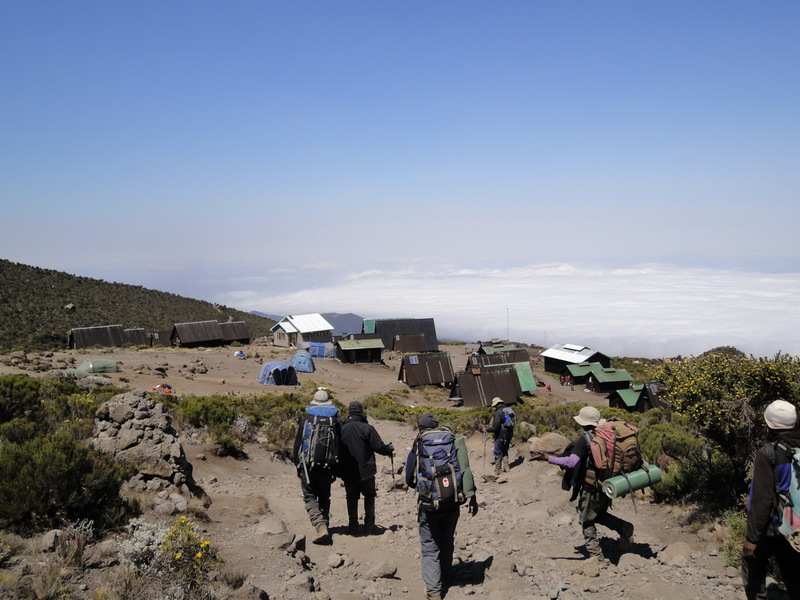 Around 500 meters to Kibo, a number of porters from our crew came to our assistance. Mark (the assistant waiter) brought fresh juice to us, a sort of congratulatory drink for our success. It felt good to drink something other than cold water for a change. However, due to my empty stomach from almost 15 hours of trekking with no food (it was around 7PM+ by the time we reached camp), I threw up at the campsite. I felt much better after having dinner. 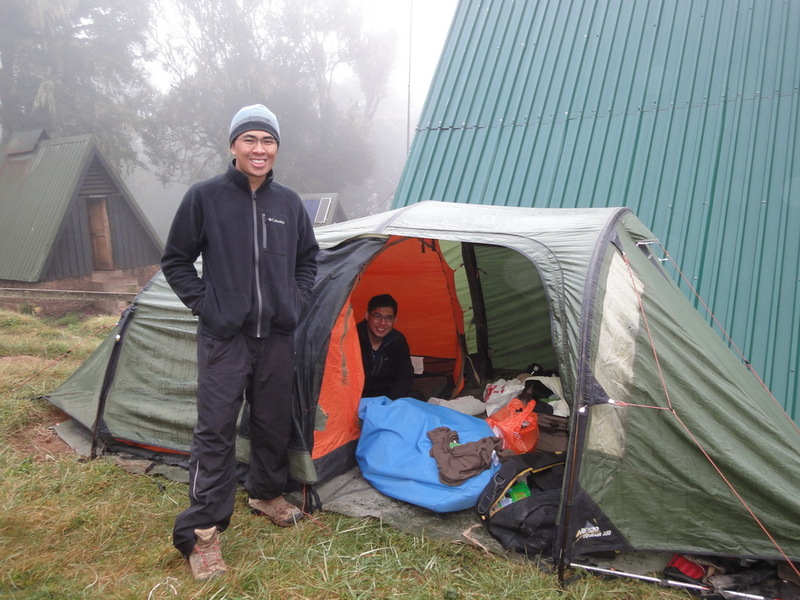 Aiman and Fazril had a quick meal, after that they retreated to their tents to rest. I had washed myself earlier after reaching camp, so I just relaxed at the mess tent while chatting with Nickson. Somehow I had recovered significantly after dinner and I was able to walk around the freezing campsite to enjoy our last night at 4700m AMSL. Later around 9:30PM Aiman felt hungry so I helped him prepare an instant noodle (the noodle-in-a-cup type). I have to admit, having hot instant noodle in freezing weather, while sitting comfortably in your sleeping is a nice feeling. 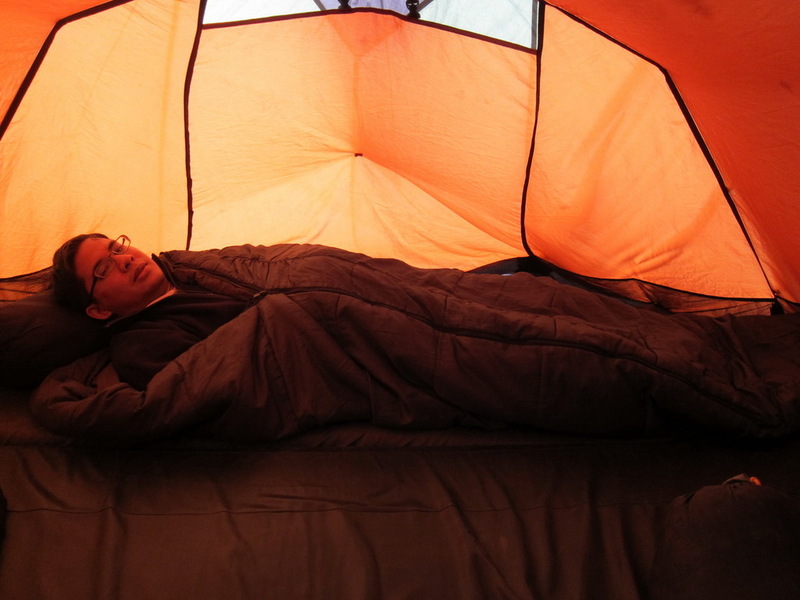 After 5 days in the mountain, the sleeping bag feels just as good as your bed at home. We woke up around 6AM. The weather was cold, but the prospect of descending later made us felt excited. After our usual breakfast, I explored the other huts in Kibo Hut, and took various photos. The huts are reserved for people on the Marangu route. 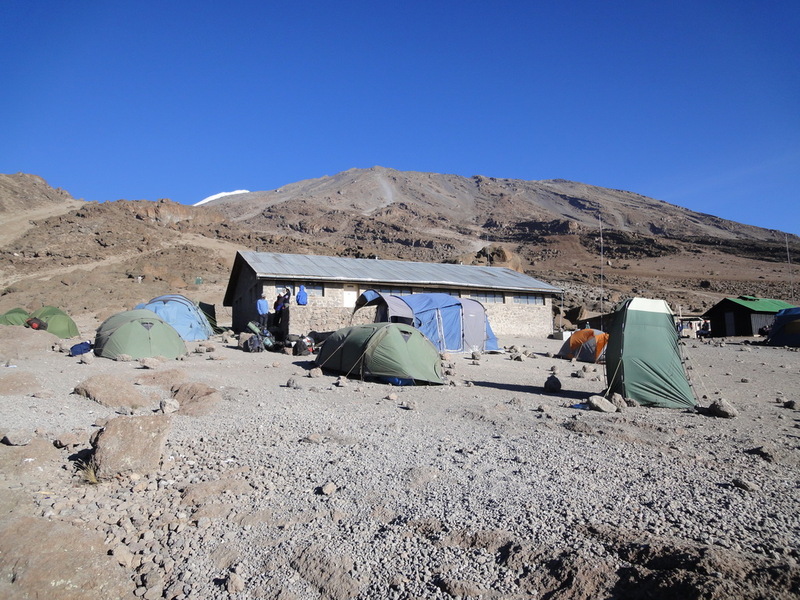 The Marangu route is the only non-camping route on Kilimanjaro. For all 5-6 days of their trip, climbers would have cosy wooden insulated huts to sleep in. 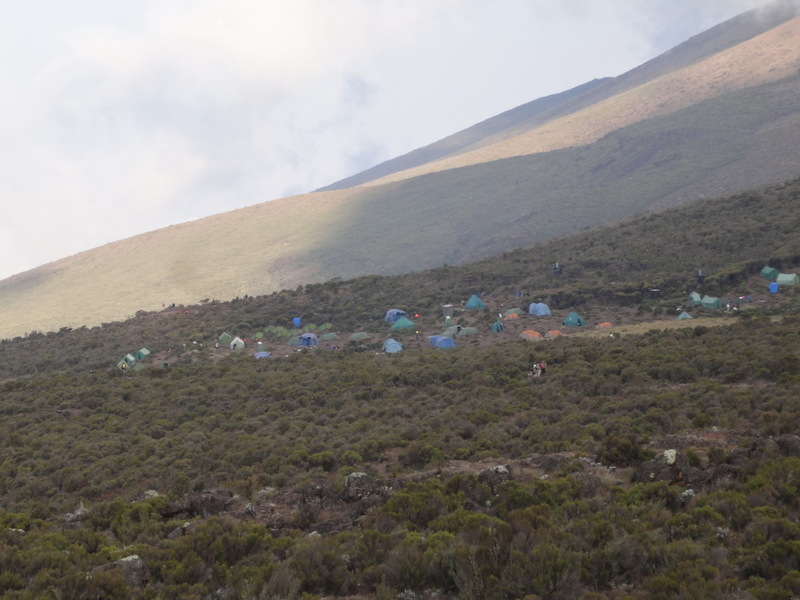 We chose the camping route as we wanted Rongai’s acclimatization, and because we wanted the camping experience. We left Kibo Hut around 8:30AM. 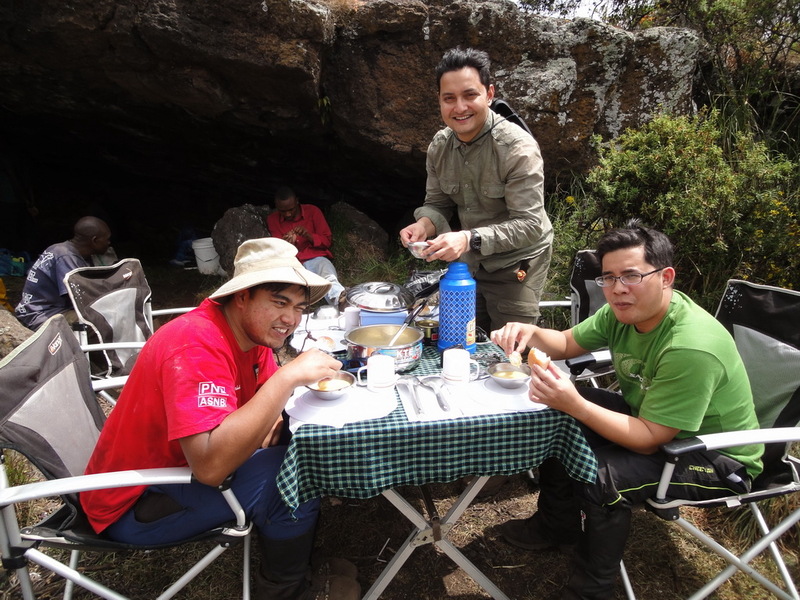 There isn’t much vegitation after leaving Kibo Hut as we were still in the rocky area of Kilimanjaro. 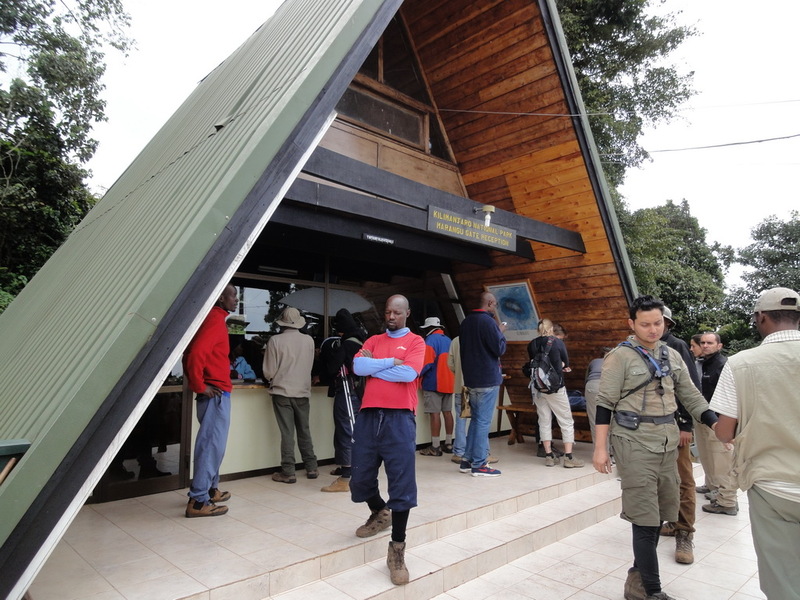 The plan today is to trek for 22KM, with a lunch stop at Horombo Hut (3720m AMSL). We descended via the Marangu route, which is south-east of the mountain. In comparison, we hiked up via Rongai which is north-east of the mountain. One good thing about the Rongai route is that you get to see 2 sides of the mountain. However, the most scenic route are the ones on the west, which are mainly the Machame and Lemosho routes. Aiman wasn’t feeling too well today. I guess his fatigue didn’t recover and he wasn’t feeling great. To add on to that, he was developing blisters and toe injury, which is common when you’re descending. The guides recommended that we wear sandals but too bad we didn’t bring any. 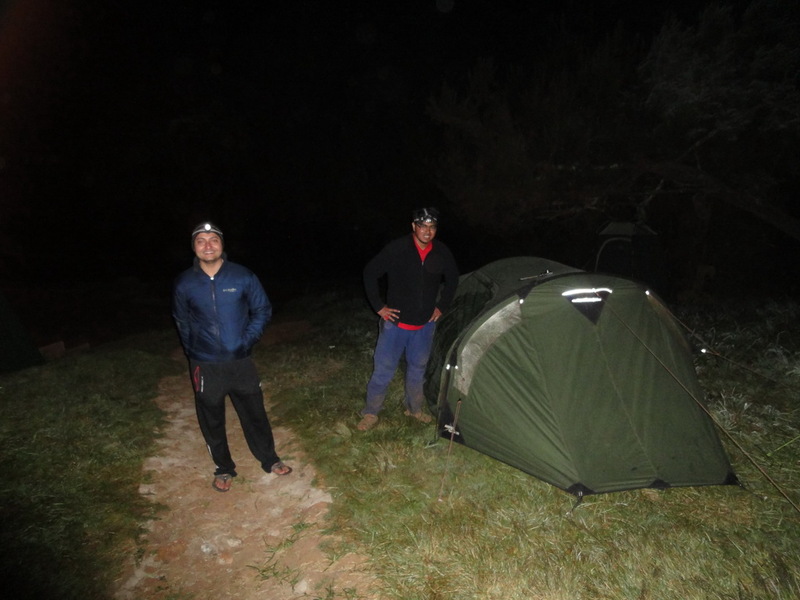 We arrived at Mandara Hut (2723m) around 7:20PM, and it was already dark. We walked past the huts. Our camp was situated nicely at a clearing, towards the end of the huts. At this lower altitude, the jungle is thick. There’s a lot of trees around us. It’s a nice change from the alpine desert and moorland vegetation that we’ve been getting for the past few days. What surprises us the most was how cold it was at this altitude. It felt like it was around 5-10 degrees. After much thinking, we guess the trees and greeneries must be the main cause of this excessive cold. In comparison, we didn’t feel this cold at Simba Camp (our first day camp), which is around the same altitude. 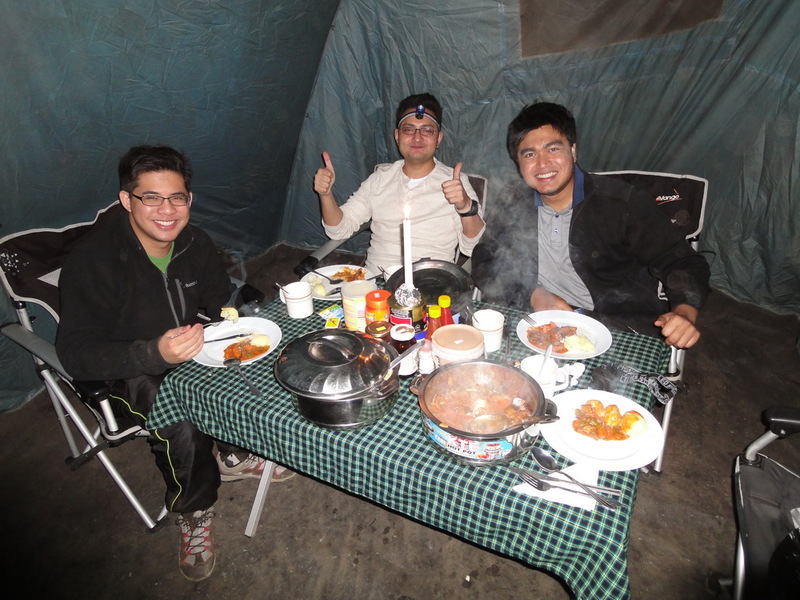 That night me, Farooq and Fazril stayed outside our camps for a bit, in the freezing weather. We wanted to enjoy our last night at camp, and the amazingly clear skies of Kilimanjaro. The stars were so clear and bright that you could possibly make out the constellations (if you know how to read it, that is). Today we woke up feeling energetic. It’s our last day of camp. Deep down in my heart I knew that I will be missing this experience. So much has happened over these past 7 days. We have seen things that not many people have seen. 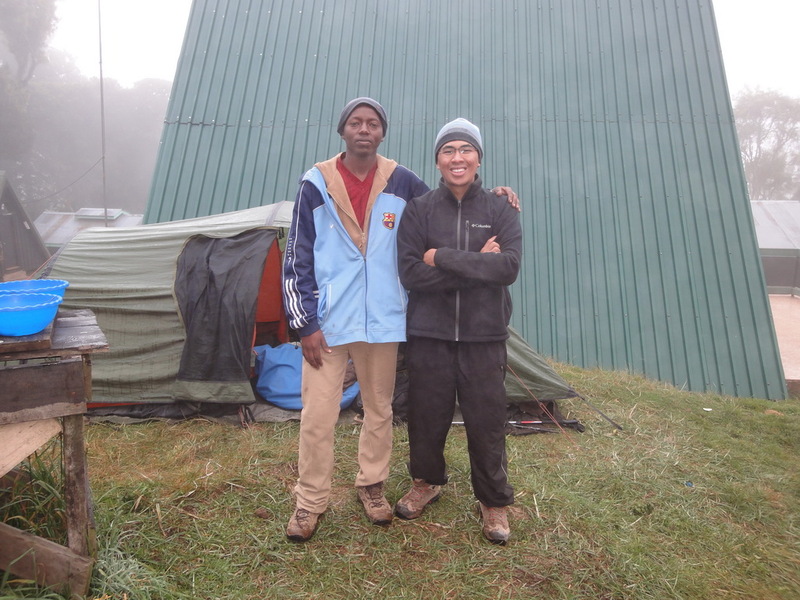 While packing up before going for breakfast, I manage to get a picture with Nickson (our porter and waiter). He’s a good man. He is currently working here to get some money to finance his part time studies. Later at the end of the trip we exchange contact details to keep in touch. Today’s breakfast was surprisingly good. We were served pancakes and fried egg. After that, we quickly packed and by around 8AM we were on our way down to Marangu Gate. On the way down I had a long chat with Sifuel (lead guide). 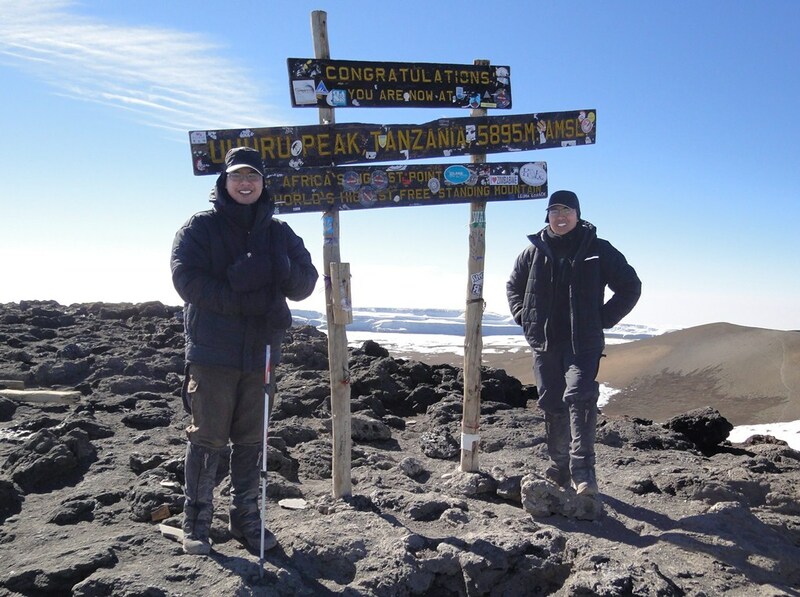 We asked our feedback, and we also spoke of many things about climbing and Tanzania in general. He is thinking of setting up his own company. I was very happy to hear that he had big plans. Something that I learnt from my trip is that the Chagga people are keen on businesses, and so far, all the Chagga men I met have shown this trait. I respect them for that. Somewhere along the way we came across people who just started their climb. Their guide smiled at us and announced to his team “these guys are on their last day, and we are on our first day”. I wished them good luck. We reached Marangu Gate just over 3 hours later. The Marangu Gate is the main gate for Kilimanjaro. It has all the administrative offices of the Kilimanjaro National Park (KINAPA) and some other souvenir shops. At the exit gate, we had to sign out. The counter next to us were a bunch of Americans who were just about to start their climb. They were having problems with the registration officer as they didn’t have enough cash to pay for the mountain fees. They had to resort to their credit card, which took awhile to be processed. 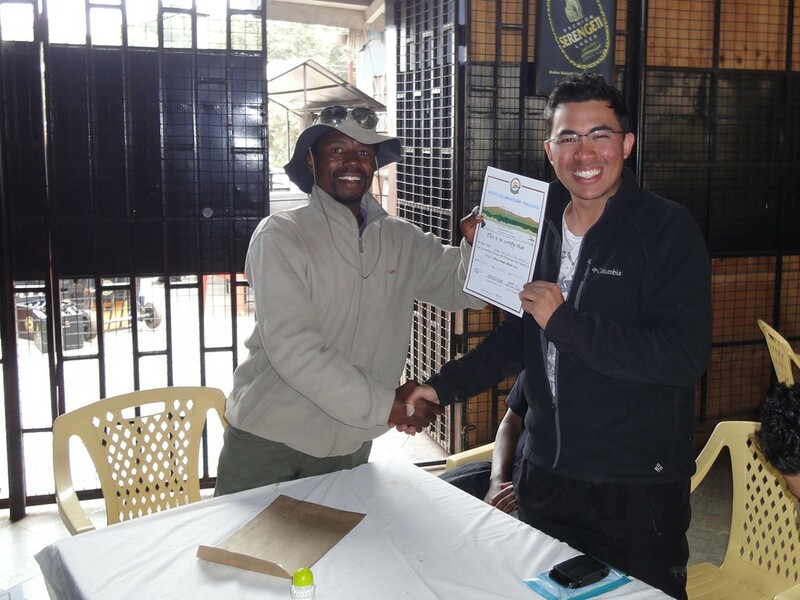 We didn’t experience any of that bureaucratic problems as Team Kilimanjaro handled it smoothly behind us. For that, I felt grateful for choosing TK. Me, Aiman and Fazril bought Kilimanjaro t-shirts from a guy near the Marangu Gate. I was kinda hoping that the porters would sing us the Kilimanjaro song and the Jambo Bwana song, but they didn’t. I was slightly disappointed. But then, I didn’t see the other climbing groups doing this. In fact, throughout my 7 day on the mountain, I didn’t see any singing (apart from small 2-3 individuals). This is contrary to what I saw on Youtube where after a successful climb, sometimes at the camp and some at the gate, all the porters would gather and they would sing to the climbers. After everything was packed, we made our way to Moshi, which is around 45 mins from the Marangu Gate. We had lunch at Chrisburger, a popular restaurant serving westernafrican food. There, we exchange comments and thank you notes, and Sifuel gave us our certificates. After that, we gave them our tips. 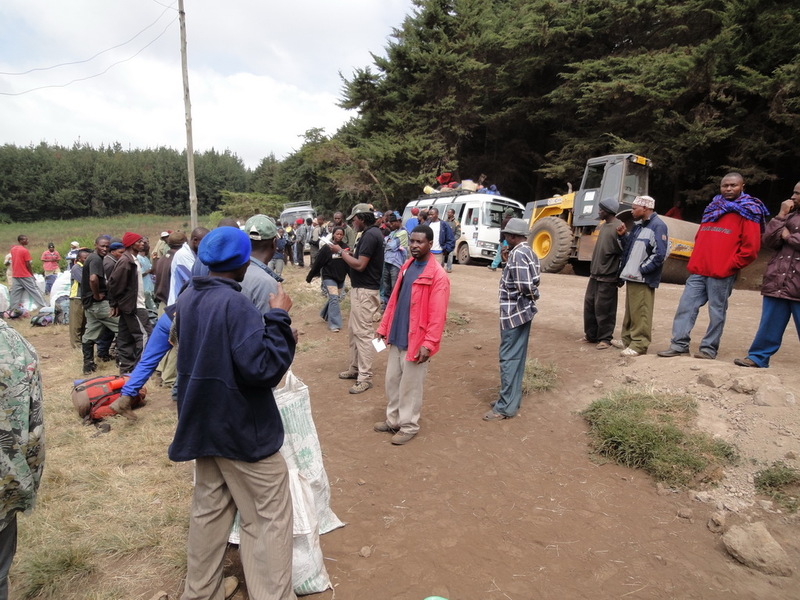 After their effort in pushing us to Uhuru, and all their first class services at the campsites, all of us decided to give them USD250 each (USD1,000 in total to be shared for all 18 members of the crew). This amount was given to Sifuel, and he would decide on who gets how much (TK has a fixed ratio system for each role (e.g. 1/10 of tip to assistant guide, 1/15 to waiter etc). I have discussed the tipping approach with Sifuel during our conversation between Mandara and Marangu, and I have decided to give the tip via him as he knows best what his team members did. Suffice to say Sifuel and team was very happy. I was glad to see their happy faces when Sifuel distributed the tips to his team members. Later when we arrived at The Outpost Lodge, I exchanged contact details with Nickson and Sifuel. I told them if they need any assistance (Nickson with his part-time diploma studies, Sifuel with setting up his new company), I would be more than happy to help out. It felt so good to be finally back in the hotel. I took a shower and after that I went down to the cafe to relax and check out the photos we took. Our flight leaves the day after at 7:30AM to Dar Es Salaam. From there, we had a 9 hour transit before our connecting flight at 6:30PM from Dar Es Salaam to Doha, and finally from Doha back to Kuala Lumpur. Congratulations! What a marvellous achievement and so beautifully documented. It’s a really super recording of events. I’m doing this route in October, so excited! Great detail ! We leave Wednesday for same route. Congratulations on summiting! Enjoyed reading your blog! Am planning on doing TK Rongai soon and found your detailed report extremely helpful! Congrats on summiting! One question for you: Did you have any problems , eg. missing luggage or delays with Precision Air? Hi Imran , thank you very much for your appreciation of our service, we are keeping them up , I can tell you that we have improved our new tents and better quality. Hi Guys, congrats once again!! What a trip!.. We are doing the same this December and still thinking of which route to choose Machame or TK Rongai.. Fantastic account. 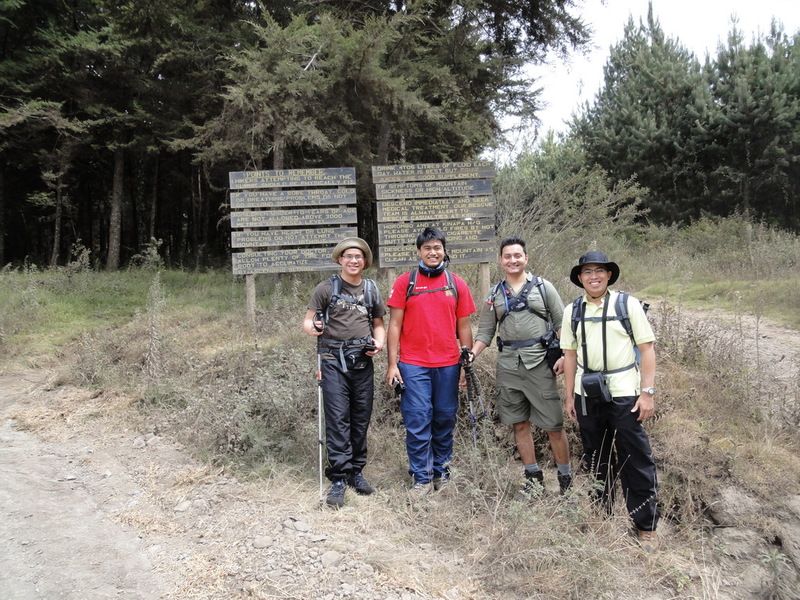 We are part of 4 man tk team doing the lemosho route. Very excited. Hi John. Thanks for visiting my blog. Lemosho is one of the best routes, you’ll get to experience the Shira plateau. All the best to you & your team! Very interesting experience! Thanks for blogging about it. Thanks for your informative blog. 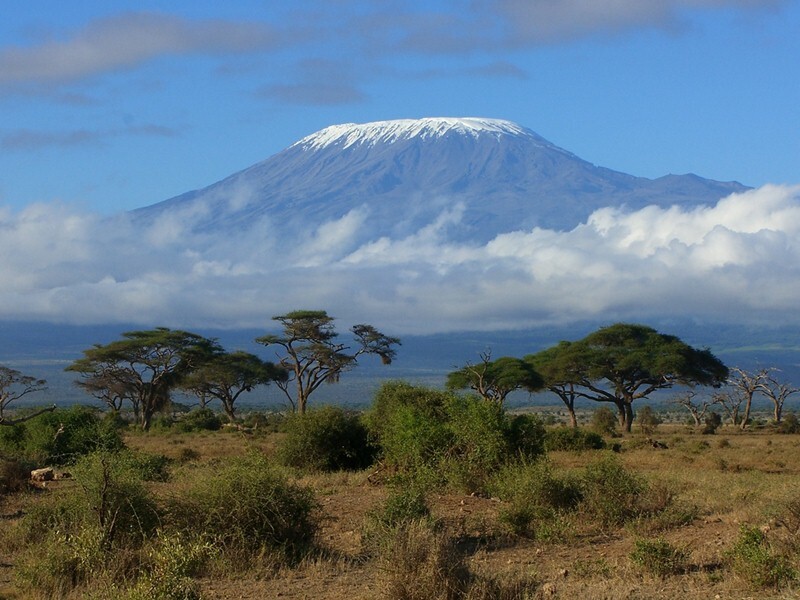 Three friends and I are to climb the Rongai TK route this December with Team Kilimanjaro. You do not state the km from School Hut to the Summit and I have not been able to find that in the TK website. Do you know it? 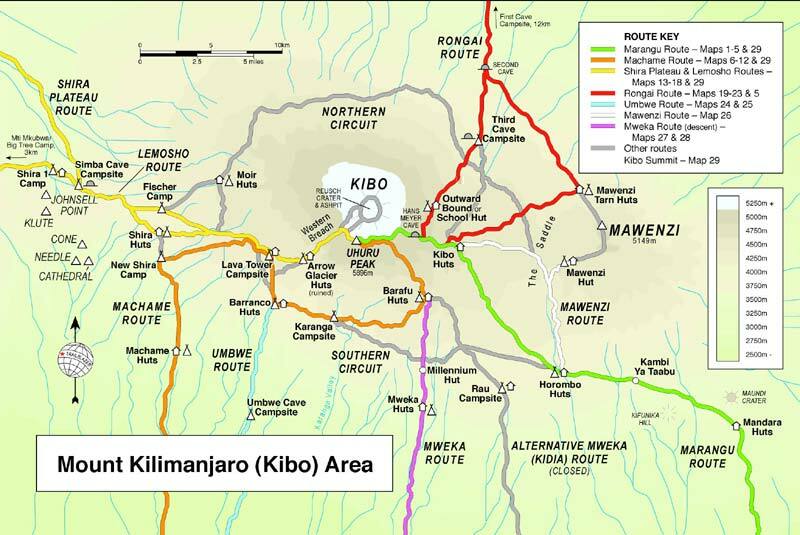 Also Km from Summit to Kibo Hut would be helpful. Distance from School hut to the summit is approximately 7km and summit to Kibo hut 6km, do you need to know anything else? Thanks very much. We feel much better prepared for our trip after reading your blog and looking at the photos and videos. Anything you wish you had done differently or wish you had brought or left behind? We are taking insulated, inflatable air mattresses to supplement what TK provides and some favorite snack items for summit day. We hike a lot in big mountains but we are all in our 50’s and 60’s. 2) to have stayed longer in Tanzania. If I had planned the trip longer, I could have gone on a longer/further Safari trip and even visited Zanzibar. Are you still checking comments? If so can you tell me if there were any parts of this route that would be terrifying to someone afraid of heights. I’ve given up the idea of doing the Barranco wall but am thinking I might be able to do the TK Rongai route. Hi Leslie. TK Rongai is pretty much flat. The only steep parts that I can remember are the hike up Mawenzi (for acclimatization) and from School Hut to Gilman’s point (refer to photos in my blog above). But it’s nowhere as steep as Barranco Wall. Thank you so much for the reply about the height/steepness!